It’s been over five years since London-based Circus Records established itself in bass music, and label kingpins Doctor P and Flux Pavilion have curated a 30-track LP, carefully selecting tracks from the label’s top artists. 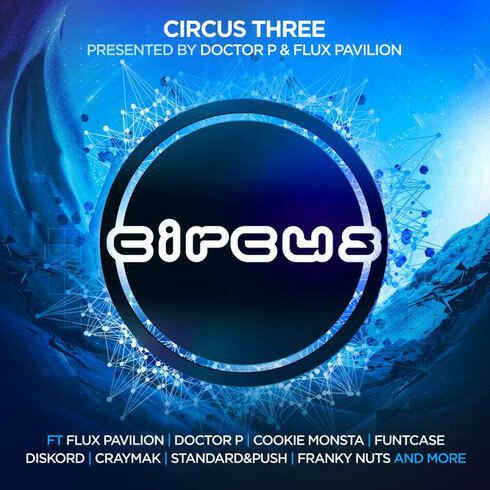 Dubbed ‘Circus Three’, the handpicked collection dispenses a variety of sounds and styles from the label’s family such as FuntCase, DISKORD, Cookie Monsta, Doctor P and Flux Pavilion. ‘Circus Three’ depicts the label’s evolution over the past six years, capturing the sounds of the modern Circus Records that have led the bass music label. Joining 18 original unreleased tracks from the classic artists Doctor P, Flux Pavilion, DISKORD, Cookie Monsta and FuntCase, with an array of beats from the latest signings to the Circus camp including CRaymak, Franky Nuts, Standard&Push and more, the album serves as a blend between the label’s more classic styles as well as the sounds characteristic of the modern music landscape. This compilation album is the third of its kind. In 2010, Doctor P and Flux Pavilion served up the first major label compilation album, ‘Circus One’, asserting Circus Records’ position in the dance music world. In 2013, ‘Circus Two’ was born, this time presented by two of the first official signings to the label, Cookie Monsta and FuntCase. Now in 2016, the label founders are back in charge to facilitate the label’s biggest and most exciting release in history. Following the release of the album on 18 November, Flux Pavilion, Doctor P, Cookie Monsta, FuntCase, and DISKORD will be heading off on a seven date US Circus tour this December. Hitting seven different cities including Los Angeles, Detroit, and Las Vegas, Circus Records will be bringing the fresh sounds into the live music arena and directly to the fans. Thanks for your marvelous posting! I certainly enjoyed reading it, you are a great author.I will always bookmark your blog and definitely will come back sometime soon. I want to encourage you to ultimately continue your great posts, have a nice evening!